Now Reliance Jio is one the most popular mobile networks in India which is known for its lighting 4G speed. However, it is found that the average internet speed of Jio is falling down from last few months due to the exponential growth in its user base. The most common cause of slow internet speed that comes after the weak network signals is your device's configuration i.e. how your device is configured to connect to the internet. These configuration settings are managed by APN. If you are experiencing slow internet speed on Jio, you need to check these APN settings on your phone. 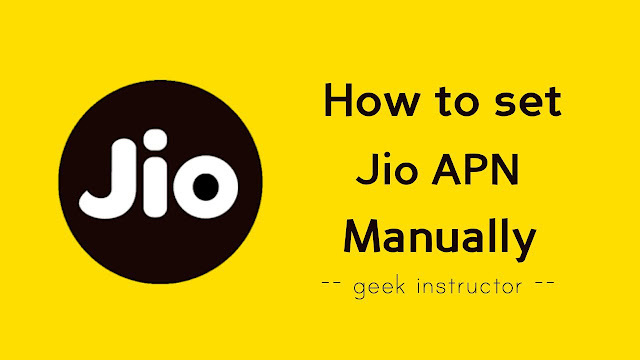 This tutorial will guide you how to set Jio APN settings manually and boost up your internet speed. An Access Point Name or APN is the name given to the settings that set up a connection to the gateway between your carrier's cellular network and the public Internet. In simple words, APN settings give instructions to your phone to connect to your network. APN is automatically configured on your phone by the service provider. You can also add it manually. Note that changing the APN can improve your internet speed, but it can also mess up with your data connectivity if it is not configured accordingly to the network settings. You actually don't need to change the APN settings on your phone as it is automatically configured by the Reliance Jio. However, if you are experiencing slow internet speed or some other network related issues, then only you need to change the APN settings. First, go to Settings > Mobile Networks > Access Point Names. Now select SIM 1 or SIM 2 in which you are using Jio. You will find Jio 4G default APN already there. Tap "ADD" button at the top of the screen. Now go back to Access Point Names settings and select the new APN you have created. 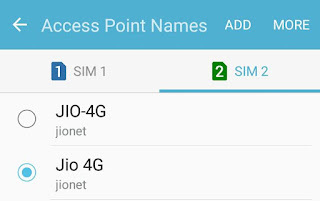 So that's how you can set Jio APN manually on your phone. Make sure to read this tutorial also: how to increase Jio 4G internet speed. If you have any questions in your mind, feel free to share them in the comment section.